For those living close to the river, the past few weeks must have been an absolute nightmare. FOR those living close to the river, the past few weeks must have been an absolute nightmare. Watching the steadily rising floodwaters and knowing that there was precious little they could do to stop their homes and businesses from being inundated is a deeply traumatising experience and I can only offer my heartfelt good wishes to people trying to recover. The argument about whether more could have been done to prevent such extensive flooding will rumble on, I’m sure. But for my good friend and artist Doug Myers, whose home at Weybridge was just inches above the flood waters, it presented an opportunity to capture the effects of the Thames in spate on paper. 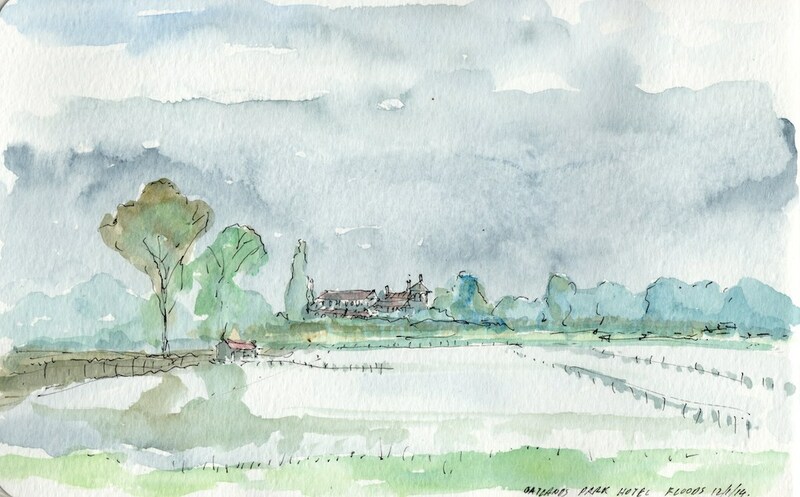 He sent me these two stark impressions of the river as it was overflowing its banks – one looking towards Walton Bridge from the direction of Weybridge, and one of the back of the Oatlands Park Hotel as the waters covered the surrounding fields. 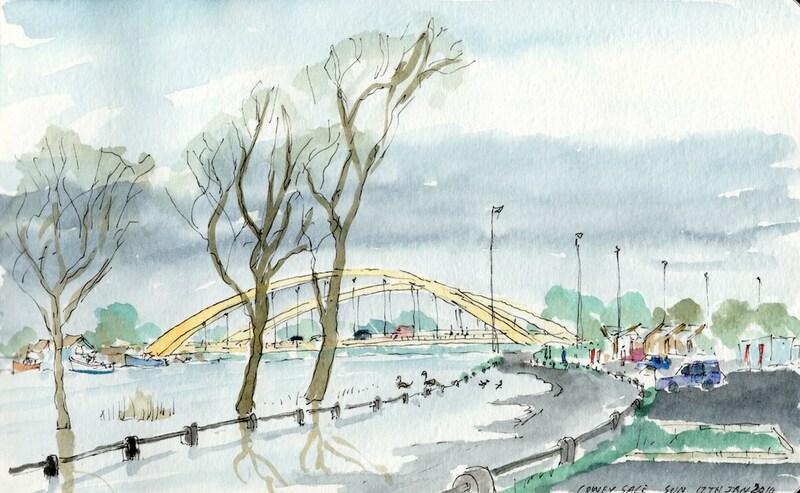 Doug tells me: “I was trying to get along to Chertsey Bridge to sketch the effects of the flooding there but the roads were simply impassable. I wondered if any of your readers might have taken photos of the flooding around the bridge, Dumsey Meadow and on the road between Chertsey Bridge and Shepperton? If you can help, email your photos to me at the address below and I’ll gladly pass them on to Doug. 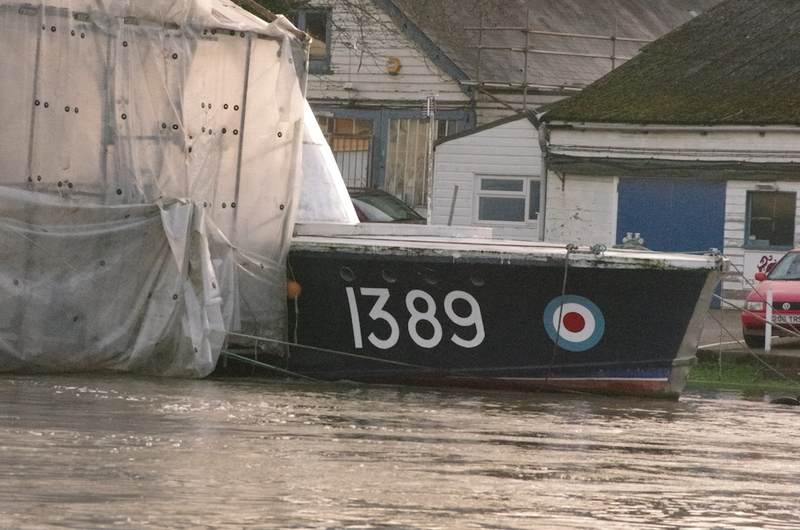 ANOTHER recent correspondent was former Spelthorne Mayor, Malcolm Royer, who sent me the attached photo of what appears to be an old air-sea rescue launch numbered 1389 undergoing some work at Tims Boatyard in Staines. Malcolm wondered about its background and after a bit of digging, I discovered that it was one of the last ‘crash boats’ as they were called. To be based at Newhaven Harbour on the south coast. These incredibly fast boats – capable of speeds of up to 35 knots – plucked many a downed RAF pilot from the waters of the channel during and after the Second World War and it’s great to see that some of them still survive. Malcolm himself has a link to these craft because he collects old valve radios, one of which he believes was taken from an air-sea rescue launch. He said: “My interest came from my grandfather, Lindley Royer, who worked for the BBC as a sound engineer from just before the war to about 1965. “I have about 20 valve radios, nearly all ‘woodies’ that date from about 1934 to 1945. “They include such makes as Bush, Kolster-Brande, Ferguson, Ferranti, HMV, EKCO, Westminster, Pye and Pilot, The woodwork and the veneers are colourful and sometimes intricate. “They are a piece of social history in that families would gather round them to listen to the progress of the war, listen to Churchill’s speeches and to finally hear that the war was over. 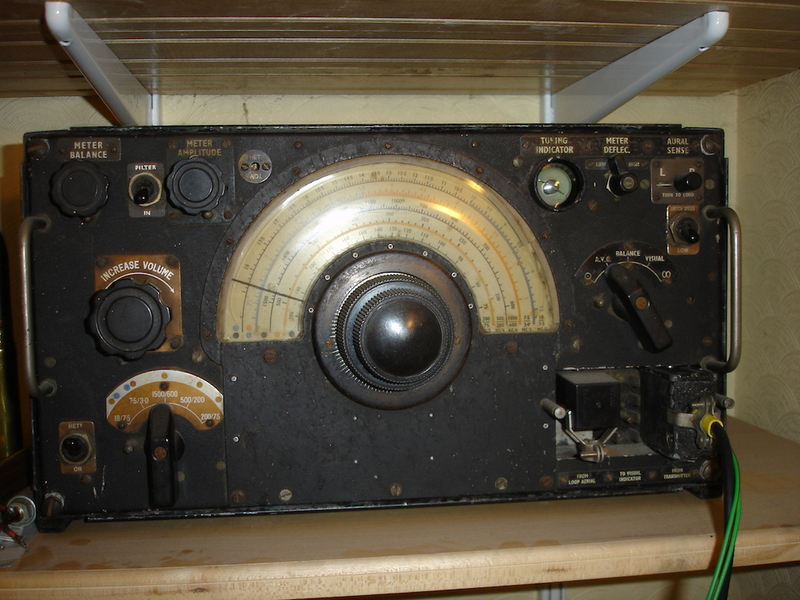 “Radios were relatively expensive. My Bush SW43 cost £18 17s 6d in 1937 when a skilled man may have been earning about £2-3 a week and this is one item that would have been purchased on hire purchase. I like the sound of a valve radio, the wooden case adds a quality to the crackle-free sound, the valves also produce a level of harmonics that are pleasing to the ear as well as the smell of a warm radio. Thanks for sharing that Malcolm. Have you got a river-related story you’d like to share? Contact me at mort.smith [at] trinitymirror.com.